We have a small kitchen garden where we grow our vegetables organically. We have compost pits where garden wastes and vegetable wastes from our kitchen are settled. Our kitchen garden caters to most of our needs of winter greens. Our vegetable garden is open to all insects and birds. Most of the times tiny leaf birds and magpie robins can be seen rummaging for caterpillars and other pests. During harsh winters, birds even peck the tender leaves of spinach or fenugreek to satiate their hunger. Working in the vegetable garden is healing and therapeutic and every harvest of vegetable gives a great sense of fulfillment. Mix whole wheat flour, oats flour, Soya flour, gram flour and salt. Add oil and mix evenly. Chop Fenugreek leaves finely and add to the flour. Knead soft dough using warm water. Cover the dough and keep for about 30 minutes. The dough becomes a little tight. Add a little water and knead again. Take lemon size balls of the dough. 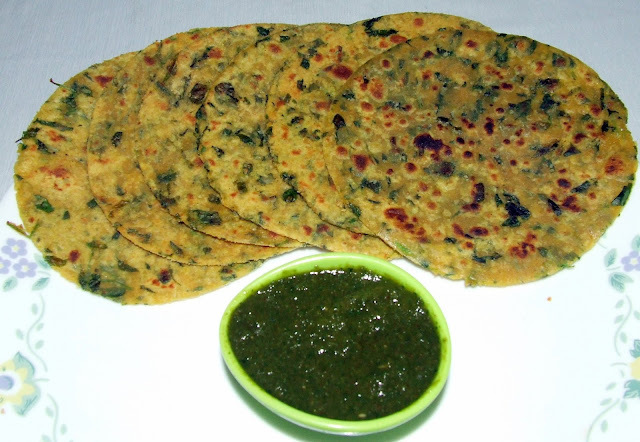 Roll out parathas using dry flour. Transfer the parathas to a hot griddle. When golden specs appear on the lower side, apply olive oil and cook till golden. Repeat on the other side. Serve hot with chutney, ketchup or curd. 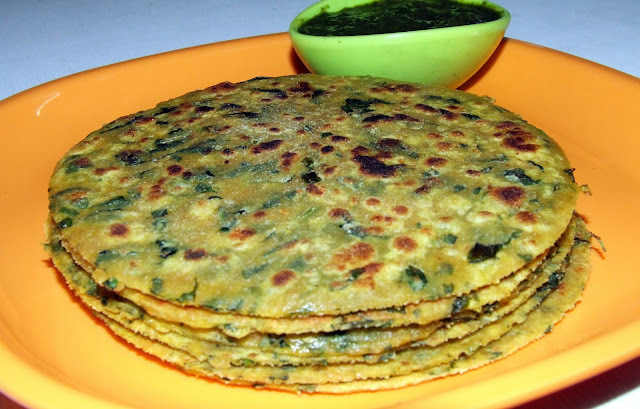 Ideal for breakfast and great as tiffin snack.